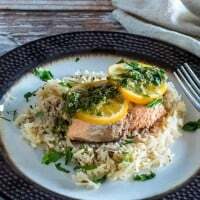 Perfectly moist and succulent salmon sits atop a fragrant lemon herb rice, and is topped with a lemon caper chimichurri. 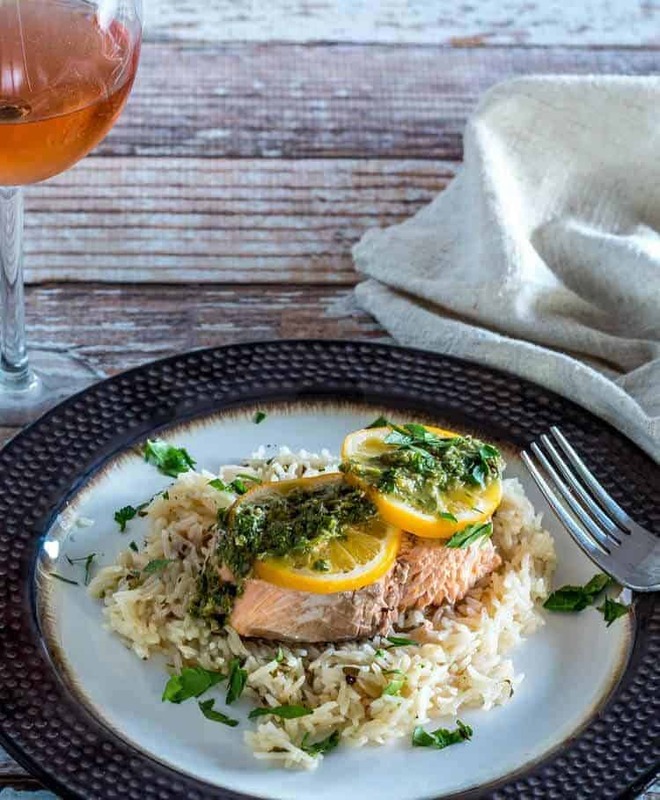 Instant Pot Salmon and Rice With Lemon Caper Chimichurri is incredibly quick and simple, and when topped with this quick chimichurri, is elegant enough for a special dinner! This recipe first appeared on Pressure Cooking Today where I am a monthly contributor. Why cook fish in a pressure cooker when it cooks so quickly on the stove? I have answered this question every time I’ve posted a pressure cooked fish recipe! Cooking fish in a pressure cooker has become a “go to” cooking method for me. It’s a very forgiving cooking method; the moist heat does not dry out the fish. The ability to stack the fish above the rice means this one-pot dish saves clean up. Serve with a garden salad or grilled asparagus, and pour a glass of crisp sauvignon blanc or rosé. Just lovely! The rice is super flavorful when sautéed with olive oil and shallot, then cooked in broth/lemon juice/wine rather than water. Thick salmon portions (1 to 1 1/2 inches) work best with the cooking time required by the rice. Thinner fillets might be overcooked. I use an Oxo Good Grips Stainless Steel Steamer With Extendable Handle to hold the fish above the rice. The extendable handle and adjustable sides of this steamer are perfect for use in a pressure cooker. After seasoning the salmon portions, top them with lemon slices, and you’re ready to lock your pressure cooker and cook it. This really is a lovely combination, and I hope you’ll get your “sea legs” on, and give it a try! Make the sauce while the salmon and rice cook. The Lemon & Caper Chimichurri is the “love child” of bagna cauda and chimichurri. Bagna cauda means “hot bath.” It’s an Italian dip for bread that our family discovered years ago. The garlic and anchovy bathe in the olive oil until very soft and fragrant. I add in a bit of crushed red pepper, and simmer over medium heat until the anchovy is dissolved, and the garlic is golden (not browned). Meanwhile, the Italian flat leaf parsley, capers, lemon juice and zest go into a food processor bowl, and the bagna cauda is then added. The mixture is pulsed until very finely chopped but not puréed. Of course if you’re not into anchovies, simply omit them. You will still have a very flavorful sauce. A tablespoon of this chimichurri elevates this dish from simple to elegant. Any leftovers freeze beautifully, and can be used atop fish, chicken, or pork. 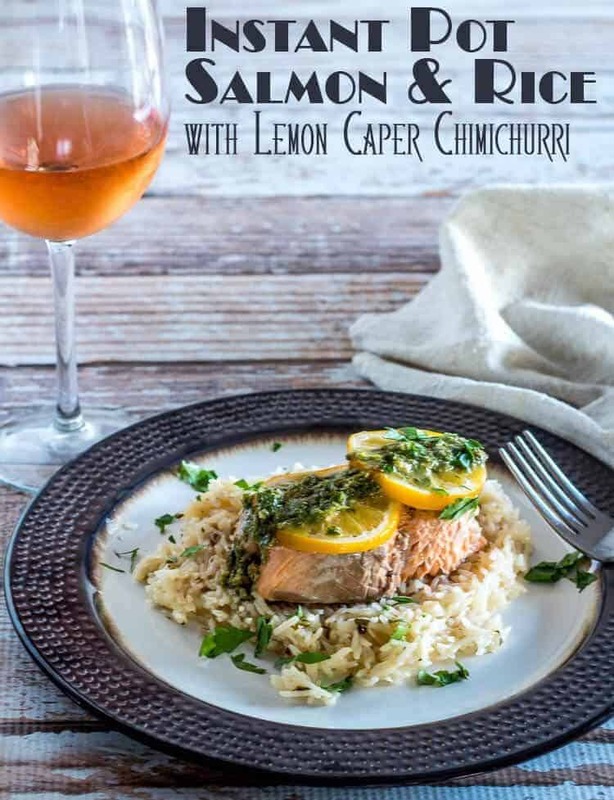 You may decide to stick with the lemon herb rice and salmon, and that is perfectly fine! If you’re interested in cooking fish in the pressure cooker, you might like to take a look at my Tropical Pressure Cooker Fish in Banana Leaves (or Parchment). Pressure cooking isn’t just for tenderizing tough cuts of meat anymore! Perfectly moist and succulent salmon sits atop a fragrant lemon herb rice, and is topped with a lemon caper chimichurri. 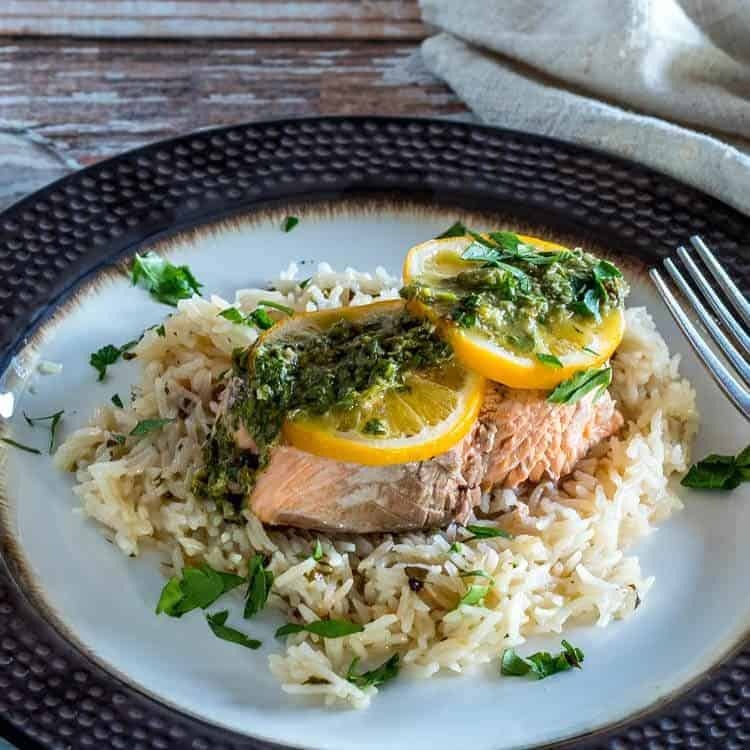 Instant Pot Salmon and Rice With Lemon Caper Chimichurri is incredibly quick and simple, and when topped with this quick chimichurri, is elegant enough for a special dinner! 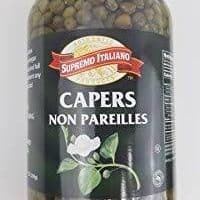 Make the Lemon Caper Chimichurri. Combine olive oil, garlic, anchovy (if using), crushed red pepper, and butter in a small saute pan over medium-high heat. Saute until the mixture is fragrant and garlic is golden. Set aside. To the bowl of a small food processor, add the parsley, juice and zest of 1 lemon, and capers. Spoon the olive oil and garlic mixture over top. Pulse until finely chopped. Scoop into a small bowl until ready to serve. To the pressure cooker, add the olive oil and shallot. Saute until fragrant. Add rice. Cook 1-2 minutes. Add liquid, parsley, zest, salt and pepper. Salt and pepper salmon portions on both sides. Place on steamer basket, and top with lemon slices. Set in the pressure cooker over the rice and liquid. 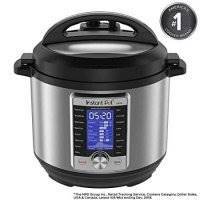 Lock pressure cooker. Set on rice setting, or about 4 minutes if using a stove top model. Remove from heat source if using a stove top model. Wait 5 minutes, then de-pressurize. 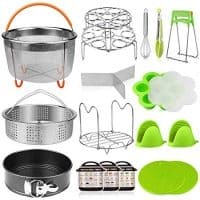 Lift steamer basket from pressure cooker. Fluff rice with a fork. Plate a scoop of the rice. Top with a salmon portion. Drizzle with the Lemon Caper Chimichurri. You may substitute a firm fish for the salmon, but be sure to use a thick portion to avoid overcooking. I stated 9 minutes as the "cook time", but it's actually about 4 minutes in the pressure cooker plus 5 minutes to de-pressurize. Macronutrients (approximate from MyFitnessPal.com): 581 calories; 40 g protein; 40 g carbohydrates; 20 g fat. Macros are based on 4 six ounce salmon portions. This looks fabulous, I'm going to make it this week to practice for a small dinner party next week. We love it, and I hope you do too! Thanks MJ! Thanks for the post! Love salmon so really looking forward to trying this recipe.